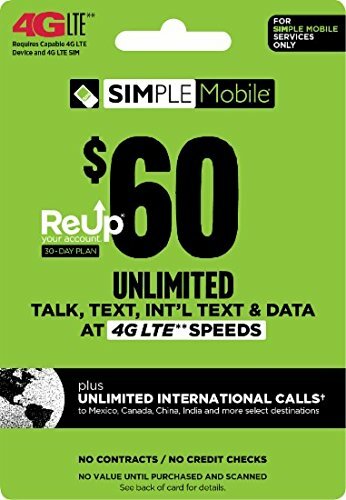 Stay connected with this Simple Mobile $60 ReUp prepaid airtime card, which works with most devices with a Simple Mobile plan and can be redeemed for unlimited talk time and text messaging and high-speed data for up to 30 days. Provides 30 days of service. If you have any questions about this product by Simple Mobile, contact us by completing and submitting the form below. If you are looking for a specif part number, please include it with your message.